Custom Anniversary Labels – Celebrating Your Successful Business! Custom anniversary labels gives a potential customer the confident feeling that they will be doing business with a solid company. Getting past the 1st year in business is an achievement and making to the milestone of year 5, 10, 15 and so on is a big accomplishment. Communicate your success with Anniversary Labels celebrating your milestones. An inexpensive way of spreading the word to your customers. Just a quick peel and stick of your anniversary stickers on your sales materials, packaging and stationery gives your business additional credibility. 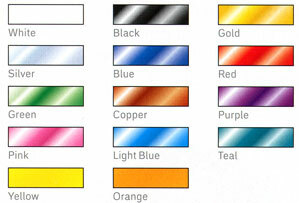 Choose from a variety of shiny gold, silver or matte black, blue or any foil you see in our legend of colors. Our designers can help put together the perfect color combination to coordinate with your companies corporate colors. In today’s marketplace, seals are an effective way to stand out. Anniversary Seals celebrates your success and reliable business. Most businesses fail before they reach their 5th year. 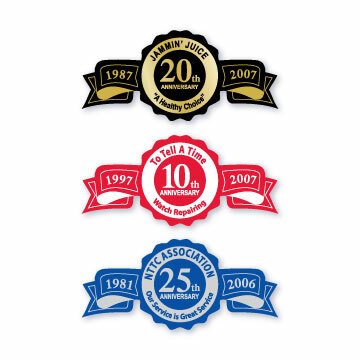 Custom Anniversary Seals enhance your business image and shows confidence to your customers showing your stability. 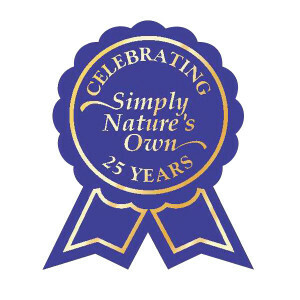 Celebrating 5 years, 10, 15 or more, we have an affordable range of unique shaped labels that can be beautifully printed, foil stamped and the most elegant seals that are foil embossed. Each seal is as unique as your business and seals can be created in any shape and size. We purchased a new laser die cutting machine and this allows the customer to make any shape label with no additional die costs! Add your seals to brochures, packaging, invoices and letters to send the important message of trust. 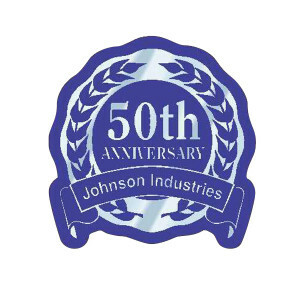 Printed seals can be designed to say Thank You, Made In America or anything that is important to your company.